The ArTICLE Following is the australian's front page story. Photos missing. How a particle spray would form following a collision of protons, as simulated by the ATLAS detector. PHYSICIST Joe Incandela must see the irony. Like all his international colleagues, he'd promised to keep his group's findings a secret, saving the news for last night's live two-way seminar from Geneva and Melbourne. The plan was that as the world's scientific and media community waited breathlessly, Incandela would reveal that they'd confirmed the existence of the "God particle", the long-sought-after Higgs boson, the cornerstone of modern physics. But after successfully battling Melbourne - host of this week's International Conference on High Energy Physics - for the right of Geneva to share presentational glory, and keeping the twittersphere and blogosphere at bay for weeks, it was Incandela's own laboratory that blew it. The European Organisation for Nuclear Research (known as CERN) yesterday posted - seriously prematurely - a brief video of him explaining that, yes, his team had found evidence the Higgs boson exists. "We've observed a new particle," Incandela announces on the video. "All this is very, very significant. It's something that may, in the end, be one of the biggest observations of any new phenomena in our field in the last 30 or 40 years." He adds that further work must be done to tease out all characteristics of the particle. "But we are very excited. I'm extremely tired at the moment, so I may not appear to be as excited as I really am, but the significance of this observation could be very, very great." The tell-all video was quickly taken down by CERN, which downplayed the stuff-up, claiming the video was one of several, prerecorded to cover all possible findings: Higgs, no Higgs, and no meaningful result. As Sydney University particle physicist Kevin Varvell notes, CERN takes credit for inventing the worldwide web. And the web, adds Geoff Taylor of Melbourne University, is a very democratic tool. "The issue of shutting people up is anathema to scientists," says Taylor, leader of the Australian contribution to the second Higgs discovery team, ATLAS. Both the CMS and ATLAS teams have about 3000 members from more than 100 nations. While Taylor acknowledges controlling scientists is like herding cats, he says the video leak could be accidental. "We'll wait and see." Go back to the teams. Incandela heads the CMS (Compact Muon Solenoid) experiment, one of seven enormous particle detectors built on to the Large Hadron Collider at CERN near Geneva. It's the world's largest and highest-energy particle accelerator. The second team, ATLAS (A Toroidal LHC Apparatus), is headed by Fabiola Gianotti who, like Incandela, is Geneva-based. It's been a long quest. The Higgs boson is an elementary particle first proposed in three papers in 1965, written separately by British physicist Peter Higgs, now 83, and two other teams. 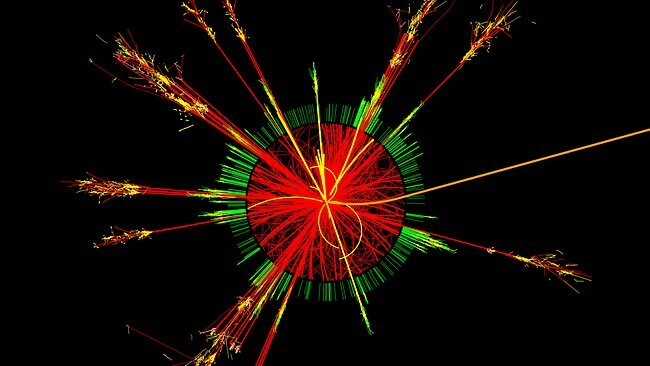 To this day Higgs says he's profoundly embarrassed that the particle was named after him. All six authors were honoured in 2010 with the J.J. Sakurai Prize for Theoretical Particle Physics, one of the most prestigious prizes in the field. Now that their hypothetical particle is no longer hypothetical, bets are on that they're in line for the Nobel Prize. That's because the Higgs is the cornerstone of modern physics. It's the particle that endows other elementary particles - such as protons, neutrons, quarks and leptons - with mass, according to the Standard Model of physics that describes the interactions of all known subatomic particles and forces. The Higgs was the only subatomic particle that hadn't been observed. In the low-energy world of everyday life, mass is referred to as weight and is measured in units such as kilograms and pounds. In the high-energy world of physics, mass is defined as an object's resistance to acceleration, its inertia, its drag. According to theory, in the beginning all particles were created equal. They all had the same mass and zipped about at the speed of light. But today, different subatomic particles clearly have different masses; otherwise, there would be no stars, planets, cats, dogs or particle physicists. Something produced that cosmic inequality and the Standard Model suggests that something is the Higgs field, an invisible energy field that switched on a trillionth of a second after the big bang blasted the universe into existence 13.75 billion years ago. As Taylor explains, the Higgs is the "manifestation" of that field, as photons of light are the manifestation of the electromagnetic field. That's why both photons and the Higgs are known as bosons, or carriers. "The field is everywhere," he says, eerily echoing Zen masters and Jedi knights. The Higgs does its mass-imparting job, explains Taylor, in much the way water slows down swimmers. "Subatomic particles feel the effect of the field like bodies moving through water. They gain mass, inertia." The more a particle "feels" the field, the heaver it becomes. The discovery of the Higgs boson is near-proof that the universal field exists and thus lends, well, weight to the Standard Model. It was built with the co-operation of more than 10,000 scientists and engineers from 100-plus countries, as well as hundreds of universities and laboratories. "One of the wonders is that it works, given all the different groups, nations and personalities," says Varvell, who rates it as one of the most successful scientific endeavours of all time. The Australian understands that is the main reason CERN heavied organisers of the Melbourne conference, chaired by Taylor, insisting that Incandela and Gianotti deliver their findings from Geneva. In rough economic times, success and glory are as precious to national funding as the Higgs boson is to particle physicists. Given the spectacular success of the LHC, there's little likelihood that nations will withdraw their support, as rumoured in recent months. Australia's contribution to the $1 billion annual operating cost is a modest $150,000 a year, well below concern to budget-conscious Labor or Coalition razor gangs. From Geneva, CERN director-general Rolf Heuer claims that over its nearly 60 years of existence the organisation has weathered many financial storms. "I can't predict the future, but I can say that our member states approved the lab's 2013 budget at (this month's) meeting of the CERN council," he tells The Australian. "It also looks bad for science," says Taylor. "We don't want to be thrashing about with rumours, though in this case it was more than rumours." Still, the rumour mill had edged in on the facts before the premature posting of the Incandela video. The Higgs boson not only has its own hashtag, #HiggsRumours, it recently topped the list of trending Twitter topics. Social media mentions reached fever pitch last week, much of the content predicting what Incandela revealed, though it wasn't confirmed until last night that the same evidence had been found by the ATLAS team. And that's just what scientists worldwide are doing right now. HUMANITY'S understanding of the origin of the universe after the big bang has taken a historic leap forward with the discovery of a subatomic particle that scientists have been searching for and theorising about for almost 50 years. In jubilant scenes in Geneva and Melbourne, physicists learned that scientists working at the $10 billion Large Hadron Collider in Switzerland had found what they believe to be the Higgs boson or "God particle". The European Organisation for Nuclear Research, or CERN, announced the "milestone in the understanding of nature", saying it had found a new subatomic particle consistent with the Higgs boson. "The next step will be to determine the precise nature of the particle and its significance for our understanding of the universe," a CERN statement said. Peter Higgs, 83, the shy and softly spoken British physicist who, along with two other groups, published the conceptual groundwork for the particle in 1964, expressed his joy yesterday. He said he was "astounded at the amazing speed with which these results have emerged". "They are a testament to the expertise of the researchers and elaborate technologies in place," he said. "I never expected this to happen in my lifetime and shall ask my family to put some champagne in the fridge." In Melbourne, at the High Energy Physics Conference, where, along with Geneva, the results were announced, young physicists Anna Kropivnitskaya, Konstantin Toms and Maria Toms laughed and said the new particle, or boson, was science, not science fiction. "But it does improve our knowledge of the universe, the basis, the foundations," Konstantin Toms said. "It means the Standard Model of particle physics is true and complete and we have discovered the last missing piece." The discovery, by two separate teams, is hailed as virtual confirmation that the Standard Model of physics is correct, as the Higgs is a cornerstone of the model that describes the interactions of all known subatomic particles and forces. The Standard Model is a highly successful theory but has had several gaps, the biggest of which is why some particles have mass but some, such as the photon, do not. According to the Standard Model, the Higgs boson is the manifestation of the so-called Higgs field, an invisible energy field filling all space. The Higgs gives mass to other subatomic particles such as protons, neutrons, quarks and leptons. University of Melbourne particle physicist Geoff Taylor said it did this in a manner similar to the way water slowed down swimmers. "Subatomic particles feel the effect of the field like bodies moving through water. They gain mass, inertia," he said. The more a particle "feels" the field, the heaver it becomes. The boson is believed to exist in a treacly, invisible, ubiquitous field created by the big bang 13.7 billion years ago. The discovery was made by two separate teams, analysing data from the Large Hadron Collider, a giant underground lab where protons were smashed together at nearly the speed of light, yielding subatomic debris that was scrutinised for signs of the fleeting Higgs. Professor Taylor, who heads the Australian team participating in one of the two experiments - the A Toroidal LHC Apparatus or ATLAS - described the results as "fantastic" and confessed he'd put the champagne on ice in anticipation of the announcements. Like the second experiment - the Compact Muon Solenoid detector - ATLAS was designed to search for the Higgs, using the Large Hadron Collider built by CERN between 1998 and 2008. Two CERN labs, working independently of each other to avoid bias, found the new particle in the mass region of about 125-126 gigaelectronvolts, according to data they presented yesterday. Both said the results were "five sigma", meaning there was just a 0.00006 per cent chance that what the two laboratories found was a mathematical quirk. In the 48 years since Emeritus Professor Higgs and five other scientists predicted the existence of the boson, wild claims have been made for the "God particle". Theoretical physicist Michio Kaku has said the discovery could begin to explain eternal questions sometimes called the mind of God: "To me, when we finally dicsover the 'God particle', this is just the beginning. This can open the floodgates for a whole new branch of theoretical physics. "There are eternal questions that cannot be answered in the framework of conventional physics. Is time travel possible, are there gateways to other universes . . . are there parallel universes?" by: Leigh Dayton, Science writer; From: The Australian; July 05, 2012 12:00AM .... a reliable intellectual tool to do so, despite a few intriguing inconsistencies.